I never ate okra as a child. My Mom just didn’t cook it. I had it for the first time at a friends house and loved it. So this started my trial and error trying to cook it . After many, many pounds of okra all I had was this slimy vegetable that couldn’t get past my lips. So I stopped trying to cook it. Last week I was at my friend Maria’s again, I am a real pest. She was cooking okra and showed me how to do it right. One pound bag of frozen okra, do not defrost it. Two small cans of tomato sauce. Optional spices are oregano and crushed red pepper. I just love basil and put it in everything. Add the frozen okra, parsley, basil, salt and pepper. 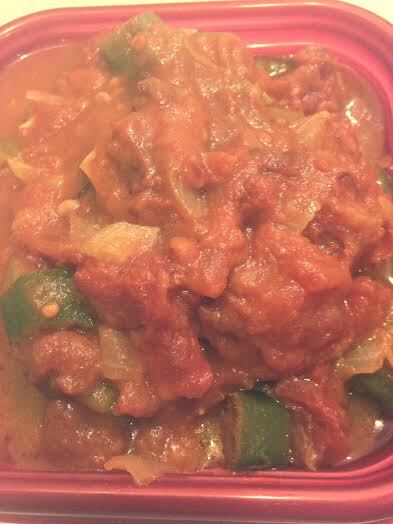 Cover the pot and let simmer until the sauce starts to thicken and the okra looks cooked about 20 to 30 minutes. If you start stirring the pot the okra gets slimy because it starts to break up. I made this the other night and we ate the entire pound. It is easy, delicious and different.